Uses: Bible Study, Church, Religious Colors: Gray/White Lengths: 9 panel 16'-9" Heights: 6'-0"
The expanding youth group of this church needed additional meeting space within their existing church facility. To accommodate this growth, the church needed a simple and effective solution that allows the group to repurpose an area in the church yet create a private youth group ministry space. After researching their options, the church pastors purchased Screenflex room dividers as the best option to fulfill their needs. Their room dividers arrived fully-assembled and ready to use. 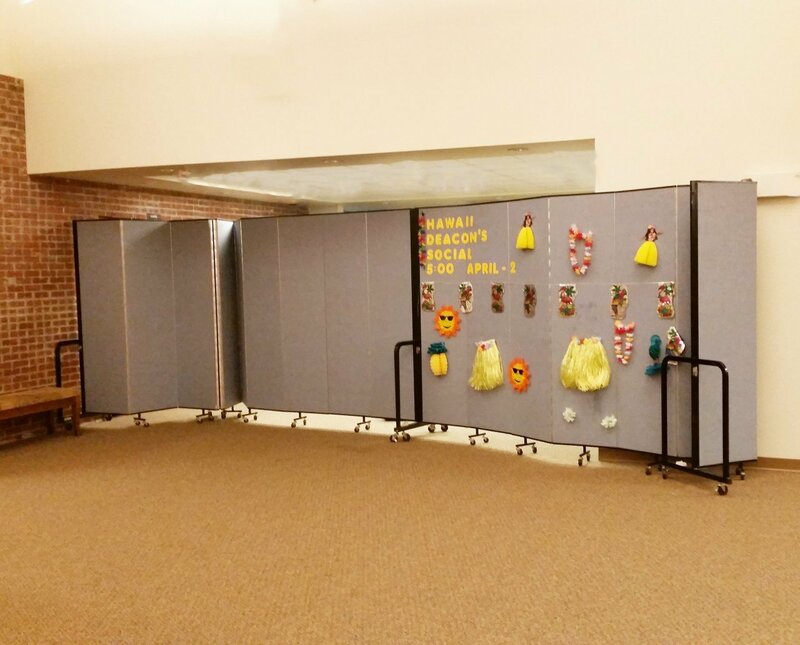 Two Screenflex room dividers are connected, with an optional multi-unit connector, to create one long continuous wall that is extended across a section of the hallway to create the needed youth group meeting room. When the youth group meeting is complete, the room divider is moved to another section of the church or stored away in a 2’x3′ space until the next meeting. Church administrators tack, pin and staple items on the opposite side of the fabric room divider to advertise an upcoming event. What a great way to use the room divider for multi-purposes.